An elementary school or primary school is an institution where children receive the first stage of compulsory education known as "primary" or "elementary education." "Elementary school" is the preferred term in many countries and especially in North America, while "primary school" is the preferred term in the United Kingdom, India, Australia and New Zealand and in most publications of the United Nations Educational, Scientific, and Cultural Organization (UNESCO). The major goals of elementary education are achieving basic literacy and numeracy for all students, as well as establishing foundations in science, geography, history, and other social sciences. Usually elementary schools also provide experience of music and art. An important aspect of the elementary school is to introduce children to the larger society. This involves socialization—the learning of appropriate social behavior and skills while interacting with peers, developing friendships, and respect for those in authority, namely the teachers. To facilitate these social skills, elementary schools usually place children in classes with one teacher who will be primarily responsible for their education and welfare for that year. The continuity with a single teacher and the opportunity to build up a close relationship with the class is a notable feature of the primary education system. A successful elementary school is therefore one that not only achieves success in teaching children to read, write, and basic mathematical skills, although these are essential, but which also creates a harmonious, supportive social environment which encourages children to develop their character and personality as well as learn to relate well with others. Such an environment can be seen as an extension of a healthy family. Elementary schools as publicly financed and compulsory for all children did not emerge in the West until the middle of the nineteenth century, and then even later in the rest of the world. Originally, those who could afford to hired private tutors to educate their children or enrolled them in boarding schools. 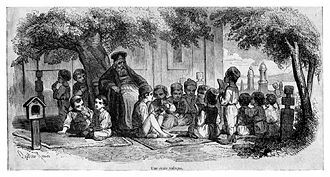 Orphanages and disciplinary schools were also places where groups of children received education. However, after the industrial revolution, a new form of primary education started to develop. Certain skills were required to perform the majority of jobs and so governments in Europe and America started to create schools were working class children received manual training and elementary instruction. They provided a restricted curriculum with the emphasis on reading, writing, and arithmetic. Often, these schools operated on a 'monitoring' system, whereby one teacher supervised a large class with the assistance of a team of monitors, who were quite often older pupils. Not long after, another reason for publicly funded and governed schools arose. Governments realized that conformity to the values and desires of a societies' majority could be inculcated as part of the system of educating the young. Hence schools became not just a way to train skills and basic knowledge, but also to create citizens who would be amenable to government according to the current norms of society. As democracy began to flourish and develop more fully in the Western world, elementary schools gradually started to change into more open institutions. The old paradigm of elementary education for a few became replaced by the realization that a free society thrives when all their citizens have a certain level of education, and those schools started to become places where all children were required to attend, at least for a certain period of time. In Africa, Asia and South America, these changes happened later but more often imported from the West. In certain cases, such as in Japan during the U.S. occupation after World War II, elementary institutions were established by a foreign ruling power. Religious missionaries helped to implant the idea of elementary education in other parts of the world. Other countries modeled their own elementary schools after those in the West as they began industrializing. The U.N. has been instrumental during the later half of the twentieth century in helping to encourage the growth of elementary schools in certain regions of the world, such as Africa. Typically, elementary schools are set-up so that a child will stay in steadily advancing classes until they move on to secondary schooling. Children are usually placed in classes with one teacher who will be primarily responsible for their education and welfare for that year. This teacher may be assisted to varying degrees by specialist teachers in certain subject areas, often art, music, and physical education. There is no universal for elementary school scheduling. Even in the West, there are discrepancies between how long the school day lasts for, how many days a week a child attends school, and how many days out of the year the child is in school. In most elementary schools, administration is based upon a hierarchy. Support staff and teachers are often supervised by a small administrative board. Often there is a head official of a school in charge of the administration group. In the West, this person is sometimes referred to as principal, dean, or headmaster/mistress. However, the school's administrative staff is often supervised by the government. In certain countries, elementary schools are solely in the control of the national government. In large countries that are divided into different regions, education can sometimes fall under the responsibility of local or regional governments. In the United States, education is administered solely by the state governments, leaving the federal government little power over educational administration. Elementary schools are often funded by a combination of local and national taxes. 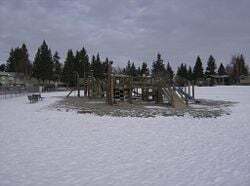 Playground outside of Calgary Science School in Calgary, Alberta, Canada. Most of the time, elementary education is offered in a single elementary school, although since what constitutes elementary education differs from country to country, there may be more than one school building a child attends before entering secondary education. For example, most countries consider kindergarten a form of pre-school and house kindergarten classes in buildings separate from elementary education but in the United States, kindergartners often attend classes at the elementary school. Elementary schools tend to be smaller and less complex buildings than secondary education schools. They also often tend to have fewer rooms, although they are larger and can be utilized in different ways. The lowest levels of elementary school classrooms may be designed so that kids can practice arts and crafts, sit on the floor while a story is being read to them, and perform other hands on activities that the smaller, more lecture driven classrooms of secondary schools cannot accommodate. Overall, primary education and primary schools represent a major problem for the continent of Africa. According to UNESCO's EFA Global Monitoring Report, in 2003-2004 barely half of the eligible children in Africa were enrolled in primary schools, the lowest enrollment rate of any region. UNESCO also reported marked gender inequalities: in most parts of Africa there is much higher enrollment by boys, but in some there are actually more girls, due to sons having to stay home and tend to the family farm. Africa has more than 40 million children, almost half the school-age child population, receiving no schooling. Two-thirds of these are girls. Cost, political instability, lack of resources, infra-structure, poverty and disease all play roadblocks to developing primary schools as stable and productive as in other parts of the world. However, UNESCO is working hard to help achieve universal primary school opportunities for all children in Africa as one of its Millennium Goals. Fundamental Education is mandatory for children ages 6-14 in Brazil. There are nine "years" (as opposed to the former eight "grades"). The current "First Year" broadly corresponds to the former Pre-School last year of private institutions, and its aim is to achieve literacy. Generally speaking, the only prerequisite for enrolling in first year is that a child should be six years old, but some educational systems allow children younger than six to enroll in first year (as long as they turn six during the first academic semester). Older students who, for whatever reason have not completed their fundamental education are allowed to attend, though those over 18 are separated from the younger children. 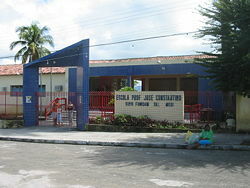 The Federal Council of Education (Conselho Federal de Educação) sets a core curriculum consisting of Portuguese, History, Geography, Science, Mathematics, Arts and Physical Education (for years two, three, four, and five). As for years six, seven, eight and nine, one or two foreign languages are also compulsory (usually English and also Spanish). Each educational system supplements this core curriculum with a diversified curriculum defined by the needs of the region and the abilities of individual students. Fundamental Education is divided in two stages, called Ensino Fundamental I (years one through five) and Ensino Fundamental II (years six through nine). 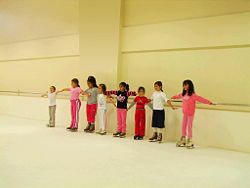 During Ensino Fundamental I each group of students is usually assisted by a single teacher. As for Ensino Fundamental II, there are as many teachers as subjects. The length of the school year is set at at least 200 days by the National Education Bases and Guidelines Law (Lei de Diretrizes e Bases da Educação). Fundamental schools must provide students with at least 800 hours of activities per year. The actual school calendar is set by individual schools which, in rural areas, often organize their calendar by sowing and harvesting seasons. More than 99 percent of Japanese elementary school-age children are enrolled in school. All children enter first grade at age six, and starting school is considered a very important event in a child's life. Virtually all elementary education takes place in public schools; less than one percent of the schools are private. Private schools tended to be costly, although the rate of cost increases in tuition for these schools had slowed in the 1980s. Some private elementary schools are prestigious, and they serve as a first step to higher-level private schools with which they are affiliated, and thence to a university. Competition to enter some of these "ladder schools" is quite intense. 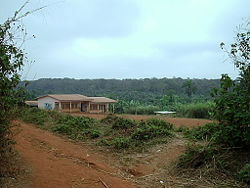 Elementary school classes are large, about thirty-one students per class on average, but higher numbers are permitted. Students are usually organized into small work groups, which have both academic and disciplinary functions. Discipline is maintained and a sense of responsibility encouraged by the use of student monitors and by having the students assume responsibility for the physical appearance of their classroom and school. Criticisms of Japanese elementary schools include pressure to conform, failure to integrate foreigners or build awareness of other cultures, lack of support for creativity, and bullying. Elementary school teachers are required to rotate through different geographical, and consequently socioeconomic, areas during their careers. They are also expected to teach different grades rather than developing expertise in teaching one grade level. The teacher stays with a group of students for at least two years, forming a cohesive unit that spends almost all their time together, not only all classes including art, music, and physical education but also lunch periods. In this way a strong sense of community is developed. As a result, Japanese schools are successful in making children into eager, motivated learners and caring, responsible citizens by meeting their needs for friendship, belonging, and contribution. In Mexico, basic education comprises preschool, primary school, and lower secondary school. Preschool covers children aged three through five and is generally provided in three grades. Pre-school is free but not compulsory. Primary education provides six years of schooling and is compulsory from age six and is generally completed by age eleven. There are several educational pathways, for specific population groups, including general education, bilingual-bicultural education, community education for children in the isolated regions of the country, and (4) adult education. The elementary school in Turkey provides eight years of education for children between the ages of six and 14. In primary school, basic information, Turkish language, Mathematics, Sciences, Social Sciences, Art, Music, Physical Education, Handicraft, English language and sometimes another foreign language (generally French or German) are taught. There are public (governmental) and private primary schools. Public elementary schools are free, while fee-paying private schools offer the same basic curriculum, but supplemented with extra-curricular activities typically including more English classes as well as swimming, more sports and better facilities in general. At the end of 8th grade students take an exam, OKS, which lasts for two hours and is composed of about 100 questions. It tests the students' skills in Turkish, Mathematics, Natural Sciences, Social Sciences and English according to the elementary school curriculum. According to their scores, children are placed in different kinds of high schools. 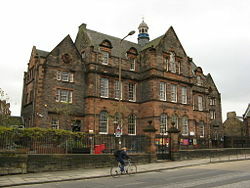 Broughton Primary School, Broughton Road, Edinburgh, Scotland. Built 1896. In the United Kingdom schools providing primary education are now known as primary schools. They generally cater for children aged from four to eleven. Primary schools are often subdivided into infant schools for children from four to seven and junior schools for ages seven to 11 (excluding Scotland, where all from age 4-12 are catered for in the one institution). In the (diminishing) minority of areas where there is a "three-tier" system, children go to "first school" until about nine, then middle school until about 13, then high school; in these places, the term "primary school" is not usually used. In the private sector fee-paying schools which provide primary education are known as preparatory schools, and they often cater for children up to the age of thirteen. As their name suggests, preparatory schools are designed to prepare pupils for entrance examinations for fee-paying independent schools. A personification of knowledge as represented by a statue of an early school teacher in The American Adventure in the World Showcase pavilion of Walt Disney World's Epcot. Elementary school in the United States, also known as grade school, is a school where grades kindergarten through fifth (sometimes, the first eight grades or up to fourth grade or sixth grade) are taught. "Primary school" generally refers to the first three or four grades (Kindergarten through second or third grade), and may be housed in a separate building. Elementary school provides and often remains in one or two classrooms throughout the school day, with the exceptions of physical education ("P.E." or "gym"), music, and/or art classes. At the beginning of the twenty-first century, there were approximately 3.6 million children in each grade in the United States. Typically, the curriculum within public elementary education is determined by individual school districts. The school district selects curriculum guides and textbooks that are reflective of a state's learning standards and benchmarks for a given grade level. Learning standards are the goals by which states and school districts must meet adequate yearly progress (AYP) as mandated by the No Child Left Behind Act (NCLB). This description of school governance is simplistic at best, however, and school systems vary widely not only in the way curricular decisions are made but in how teaching and learning takes place. Some states and/or school districts impose more top-down mandates than others. In many schools, teachers play a significant role in curriculum design and there are few top-down mandates. Curricular decisions within private schools are made differently than in public schools and in most cases without consideration for NCLB. Public elementary school teachers typically instruct between twenty and thirty students of diverse learning needs. A typical classroom will include children with identified special needs as listed in Individuals with Disabilities Act (IDEA) to those that are cognitively, athletically, or artistically gifted. At times an individual school district identifies areas of need within the curriculum. Teachers and advisory administrators form committees to develop supplemental materials to support learning for diverse learners and identify enrichment for textbooks. Many school districts post information about the curriculum and supplemental materials on websites for public access. Learning standards are identified for all areas of curriculum by individual states, including those for mathematics, social studies, science, physical development, and the fine arts as well as reading. ↑ 1.0 1.1 1.2 1.3 Kenneth R. Howey and Linda M. Post, Elementary Education: Current Trends Encyclopedia of Education (The Gale Group, Inc, 2002). Retrieved May 10, 2008. ↑ Bill J. Ranniger, Elementary School Administration: A Casebook (International Textbook Co, 1969, ISBN 0700221948). ↑ Edward H. Humphreys, Schools in Change;: A Comparative Survey of Elementary School Services, Facilities, and Personnel, 1965-1969 (Ontario Institute for Studies in Education, 1970, ISBN 0774400323). ↑ Catherine C. Lewis, Educating Hearts and Minds: Reflections on Japanese Preschool and Elementary Education (Cambridge University Press, 1995, ISBN 978-0521458320). ↑ 11.0 11.1 M. T. Ozelli, "The Evolution of the Formal Educational System and Its Relation to Economic Growth Policies in the First Turkish Republic," International Journal of Middle East Studies, 5, 1 (1974). This page was last modified on 28 May 2015, at 20:54.